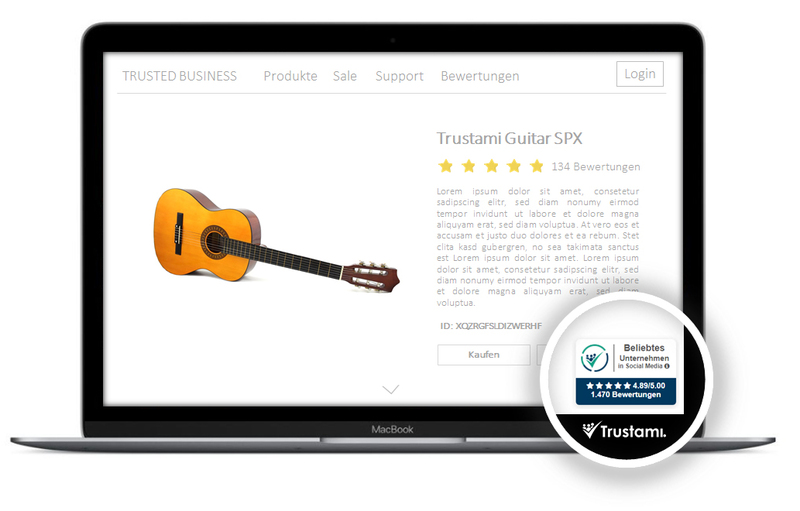 Integrate the Trustami badge on your website, your online shop or on anywhere else online and show all your reviews to potential customers at a glance. Our trust badge helps you to attract more customers and present all relevant information about your customer experiences with your business (reviews, followers or likes), with no need to leave your website. With your customizable badge, it becomes easy to present your good reputation on your website. It is up to you where you want to show your badge(s). They can be put everywhere on your website. Have you ever thought about where you got reviews and other trust building information on the internet with or without your initiative? With Trustami you can collect and aggregate all of these data (reviews, commentaries, likes, followers, views) on your public profile at one place and transport a compact view via trust badge on your own website or shop (optional). You are able to see all badges in our Demo-Account or have a look in our Blog. Build trust and gain more customers by advertising with your Trustami badge on your website! Build trust and use your good reputation as an advertisement. Publish all your reviews, likes and followers on your profile and decide which information is visible for your customers. They will see all relevant information about your business at a glance. You will get your business profile for free directly after your registration. There you can change settings, for instance your business description, review platforms, sales channels, social media portals and many more. You can add or delete platforms in order to be in control, at any time. Furthermore, your business profile is listed in our directory and can also be found by search engines to attract more customers. If you want you can use our trust badges on your website(s) for a monthly fee and assure that your customers do not have to leave your website in order to see that you are trustworthy. With the interactive Trustami configurator you can customize your trust badges and put them on your webpage within a few minutes. We give you a wide toolset, that enables you to design your badges in order present your reviews. Customize size, color and content based on your ideas. Our configurator has a live preview that let you see any changes and updates in real time. It is not necessary to integrate the badge before you configure it. It is also possible that you can change already integrated badges without changing any code on your website afterwards.